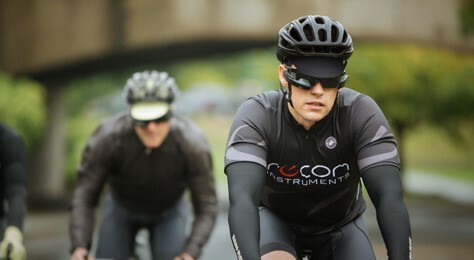 The UBC spinoff company Recon Instruments, founded in 2008, created the first wearable heads-up consumer display technology, initially for ski and cycling eyewear. Measurements like temperature, speed, distance travelled, and altitude are displayed to the wearer, appearing as though the screen is a few feet in front of them. The company had its origins in a Technology Entrepreneurship class offered by the Sauder School of Business. In 2006, MBA students Dan Eisenhardt, Darcy Hughes, and Fraser Hall, along with Masters of Engineering student Hamid Abdollah, presented a class project idea that Eisenhardt had thought of years earlier as a competitive swimmer—swim goggles that could tell the wearer his or her speed, distance and elapsed time. There were problems with the original idea, however, especially waterproofing the technology. Finally, a patent pending on a similar head-mounted goggle technology killed the plan. But being flexible enough to change the product to suit the buyer is something that entrepreneurship students hear early on to avoid future failures in the marketplace. The team pivoted, modifying their initial design to suit skiers and snowboarders. Two years later, they formed Recon Instruments. From there, they launched a series of improved goggles and an attachment that could be sold separately and used in other goggle brands. In the fall of 2012, it was announced that Oakley Airwave Goggles would use Recon’s heads-up display technology, and in early 2015, Recon’s Jet was released—glasses designed for runners and cyclists with an ultra-lightweight attachment. Jet can take photos and videos, connect to Wi-Fi and the user’s smartphone, and features patented glance-detection technology enabling the user to it turn on by looking at it, and off when they look away. In 2013, semi-conductor giant Intel decided to invest in Recon, seeing great potential for applying the company’s consumer heads-up display products to wearable computing, employing Intel chips. At the time, Recon had already shipped more than 50,000 units of its sports displays. 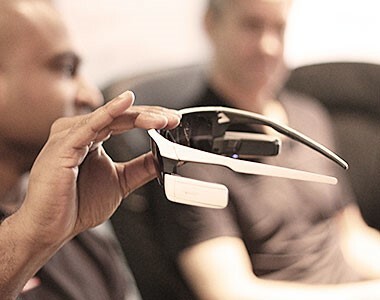 Over the next few years, Intel became increasingly impressed by Recon’s products and wearable computing team, and decided they wanted a closer relationship in order to expand the market for head-mounted display products and technologies. In April 2015, Recon was acquired by Intel. At the time, CEO Eisenhardt called the Intel acquisition a “tremendous opportunity” for Recon. “We’ll have the resources to successfully grow,” he wrote. “As the world’s most successful semiconductor company, Intel has valuable technical resources and expertise to bring to the table.” One specific benefit of the acquisition for Recon is that it would give them direct access to Intel semiconductors, allowing them to significantly expand their product line. Eisenhardt also made it clear at the time that Recon would remain in Vancouver. Since the acquisition, Intel has disclosed plans for products based on the company’s first system-on-a-chip for wearable devices, and unveiled a multiyear R&D collaboration with Oakley to incorporate smart technology into premium, luxury, and sports eyewear. The Recon Jet can now also be harnessed for industrial applications, for example, running project management software online and offline in environments where the use of smartphones, tablets and PCs may be impractical or restricted. Workers can be provided with task information and help instructions, and the high-definition camera can be used for live video support calls. Applications include assembly, maintenance, logistics, field service, and training, among others.